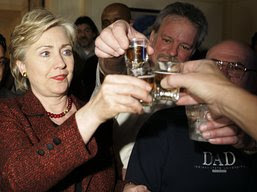 Here‘s a photo of Hillary Clinton knocking back a shots of Crown Royal at Bronko’s bar in Indiana. She looks very comfortable in that element. Daniel Henninger explores this and other facets of the “culture wars” in his WSJ column.